One of my favorite things about having the flexibility to work from home is that I can control what I eat for lunch. Unless I am meeting a friend out, I always eat healthy at home. 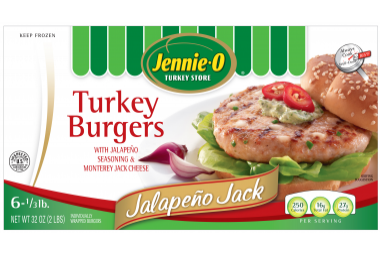 I was invited by Wholly Guacamole to try out the new Jennie-O Jalapeno Jack Turkey Burger (which is only available at Walmart through the end of March, in April, they will be available nationwide). My box full of goodies arrived and I found two Jennie-O free coupons, four Wholly Guacamole free coupons, a meat thermometer (which I desperately needed) and other fun Wholly Guacamole items. This is the same box as my winner will receive in the contest portion of this post. I knew instantly that I did not want to make a Turkey Burger with my product. I play with my food - I rarely make the same recipe twice and always like to find new ways to use products in the kitchen. One of my favorite lunchtime meals is lettuce wraps and rice bowls made with ground turkey. I used this opportunity to make a Fiesta Turkey Bowl. I will say going into making this recipe, I was skeptical - mostly because I am not a fan of ground turkey's consistency and I had no idea how a frozen patty would react. I used a half chopped onion, half of a chopped jalapeno, two turkey burger patty's and sauteed with some olive oil for 15 minutes along with some seasonings. Once the turkey came to 165 degrees, I added a half a can of corn and a half a can of black beans. I then topped it with some Wholly Guacamole and voila! It was perfect and not mushy at all. One Jennie-O Turkey Burger contains 250 calories, 16g fat and 27g protein. 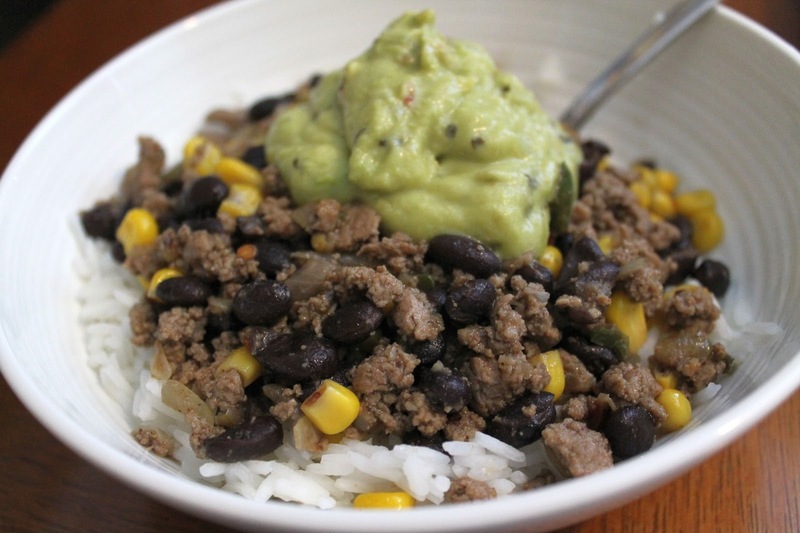 Place in a bowl on top of rice, farro or any other grain. Wholly Guacamole and Jennie-O wants you to try out their products. They are giving away the products I mentioned above (2 Jennie-O Coupons, 4 Wholly Guacamole Coupons, meat thermometer other fun Wholly Guacamole items). All you h ave to do is let me know what your favorite turkey recipe is. Make sure you enter via rafflecopter. If you are unsure how to use rafflecopter, watch this quick video. I love making taco salad with ground turkey! I love making meat loaf with ground turkey! Enjoy ground turkey tacos! Thanks! Sloppy Joes are always a family favorite using ground turkey and I would top with some Wholly Guac too! Yum! I love turkey chili and turkey tacos!! Looks so yummy. Totally bookmarking this! My favorite turkey recipe? I don't make it often since my husband is allergic, but I love to use ground turkey in spaghetti with meat sauce. Definitely chili with ground turkey - especially in the cold winter! I love making turkey chili - it is a go-to meal in our house!